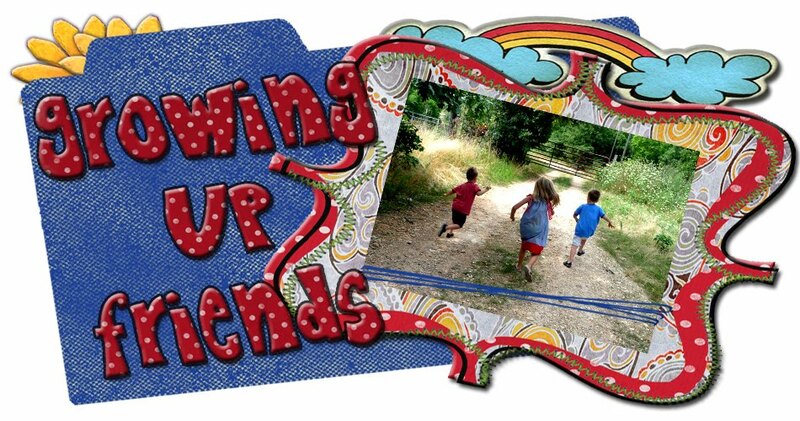 Growing up Friends: New Tricycles!! Ok, so every Tuesday is bring your bike to school day. We don't usually go on Tuesdays, but last week we did. So Caroline took her bike. The boys don't have bikes, so they took their little ride on cars. I didn't think much about it. 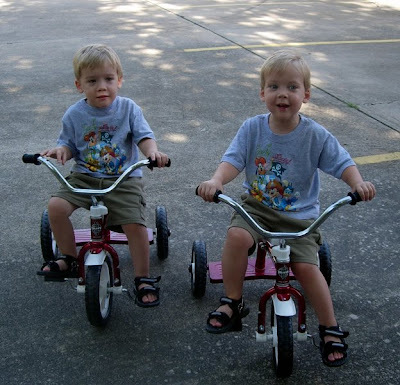 When I picked them up that afternoon, the boys tried to take other kids tricycles home with them. They cried and cried they wanted them so bad. Then Willie says, "Mommy, I got a baby car. 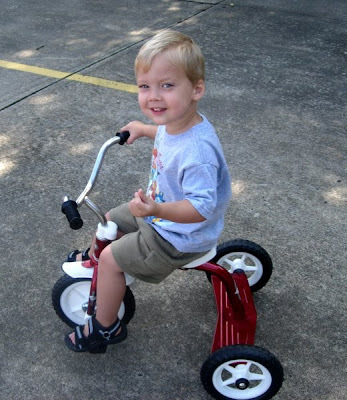 I want a big boy bike!" Ok--right then and there I felt like the most terrible mother in the world! How could I deny my angels bikes when they were OBVIOUSLY ready. 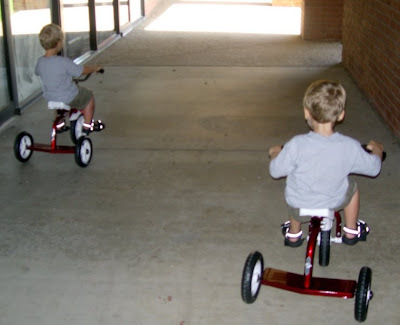 My mind was made up--the boys would have new tricycles!..........Then I started shopping for trikes--Oh my God! The cheapest one I could find was almost fifty bucks! Fine when you're buying a tricycle for one kid, not so fine when you need two. So....... I was telling my mom about the dilemma. 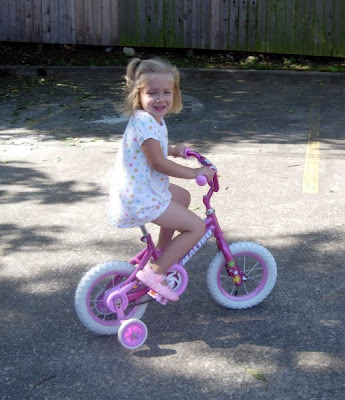 She of course made it her mission (thank God) to find these babies trikes at a reasonable price. She was relentless, and spent an entire nite of running around looking. Finally, Eureka! She showed up with two boxes full of parts and pieces, which would eventually come to be tricycles. The boys were on cloud nine. Thanks Pootie! 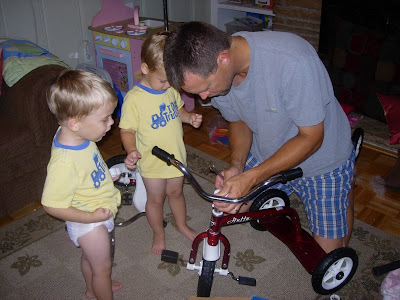 The boys were very anxious and obsessed with putting the trikes together. Jacker was definitely daddy's little helper. Will is gonna need some practice riding. 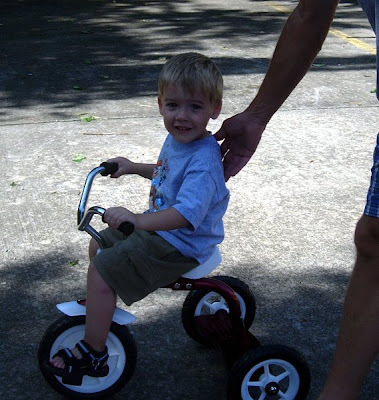 He doesn't have the coordination to keep his feet on the pedals. They would fly off and he would have meltdowns. So........Tim zip tied the souls of his sandals to the pedals so his feet would stay on. He felt much more comfortable and secure this way. He really began to enjoy himself. Jack immediately rode like a pro. He loves it! He definitely wore himself out. Sissie got in on the fun too! Will called this his tunnel (We're at greenpoint) and was obsessed with riding in the tunnel. Jack liked it because it was much cooler in there. I Know She Just Didn't! Is Vacation Really the Right Word??? Look out Beach, Here We Come! .......And Then There Was Willie.